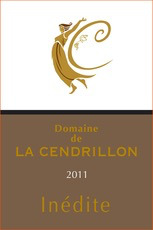 Wine Domaine de la Cendrillon Inedit 2011 - Royal Wine Merchants - Happy to Offer! The wine has a beautiful garnet colour. The nose is complex with fruity aroma of white peach, blackcurrant cream liqueur enhanced by hints of trufe and vanilla. The mouth is full, fresh and juicy with elegant, smooth and silky tannins. The finale is long with spicy and toasted coffee.